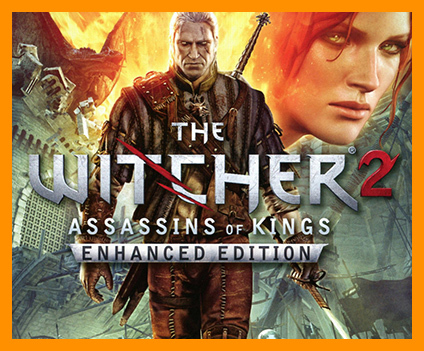 You have to try yourself as a witcher Geralt of Rivia, a professional monster killer. Finding himself in the midst of political turmoil, Geralt manages to stop the Grand Master of the Order of the Flaming Rose. Shortly thereafter, on King Foltesta attempts mysterious killer, very similar to the witch. Geralt manages to save the king and he became his bodyguard. Foltesta manages to restore order in Temeria, but the end is not yet. Baroness La Valette abdicated and settled in their fortress with a small garrison. A month later, the army Foltesta stood at the foot of the fortress of La Valette, preparing for the final assault. Being on the side of Foltesta, Geralt joined the ranks of his army, trying to find answers to their many questions.The new, ultra-modern engine RED Engine allowed to combine in the game "The Witcher 2: Assassins of Kings" amazing graphics and sophisticated game mechanics, offering players the most atmospheric and lively world of ever created in a video game. Stunning visualization allows you to fully immerse yourself in the game.Realistic linear plot of "The Witcher 2" reveals the deep player, giving imagination story, which became the cornerstone of a unique role-playing game. In addition to the epic story, the game has an excellent combat system, which is a unique combination of dynamism and depth of tactical battles. - Additional 4 hours of playing time, new adventures previously unexplored areas, complete with storyline, new characters, monsters and riddles. - New cinematic gaming scene: a large number of new clips scene, including the cinematic intro lasting 3.5 minutes, showing the murder of King Demavend Aedirna. - Creator intro Tomek Baginski began, BAFTA Award winner and Academy Award nominee. - Arena - Arcade mode, allowing players to test themselves in battle with the endless waves of enemies. His achievements in this mode can be shared with the community by uploading them on the forums, or to Facebook. 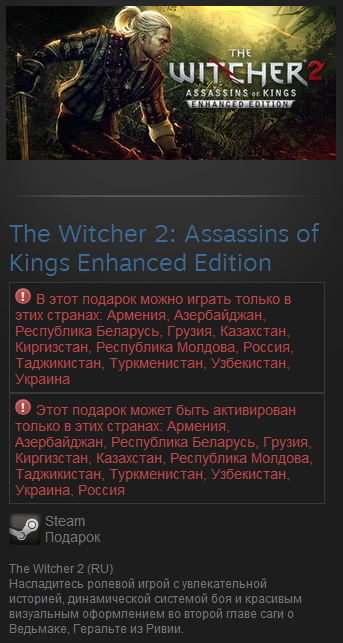 - The new learning system - gradually reveals to the players and the history of the game world of Geralt travels. - Dark level of difficulty - difficulty mode, designed specifically for professional players. It contains special "dark" items. Playing at this level, you have to carry out a thorough preparation for battle, to think of protective maneuvers and risky attack.- The official soundtrack in MP3. - The map of the game world. - Manual assignment - a full description of all tasks of the game will help beginners in the passage, and the fans - in search of missed chances. - Guide to the game - to help beginners get started.